British Prime Minister Theresa May has said that Moscow was either responsible for ex-Russian spy Sergei Skripal's poisoning, or allowed the military-grade nerve agent to get into the hands of those who were. Downing Street has summoned the Russian ambassador to the UK to explain how a military-grade nerve agent of a type produced in Russia ended up in Salisbury, May said, speaking to lawmakers after meeting with the UK's National Security Council. The prime minister said it was "highly likely that Russia was responsible for the act against Sergei and [his daughter] Yulia Skripal," and warned that Moscow now has until the end of Tuesday to disclose the details of its Novichok nerve agents program to the the Organization for the Prohibition of Chemical Weapons (OPCW). If a credible response is not received, London will consider the poisoning as the use of force on British territory, she noted. "It is now clear that Mr. Skripal and his daughter were poisoned with a military-grade nerve agent of a type developed by Russia. This is part of a group of agents known as Novichok," May said. "Either this was a direct act by the Russian state against our country, or the Russian government lost control of its potentially catastrophically damaging nerve agent and allowed it to get into the hands of others," she added. The prime minister stressed that there can no longer be any question of "business as usual" with Russia, and warned that Britain will stand ready to take more extensive measures against Moscow. According to the prime minister, the investigation into Skripal's poisoning continues. Responding to May's claims, Russian Foreign Ministry spokeswoman Maria Zakharova described the prime minister's remarks as a "circus show in the UK's parliament." 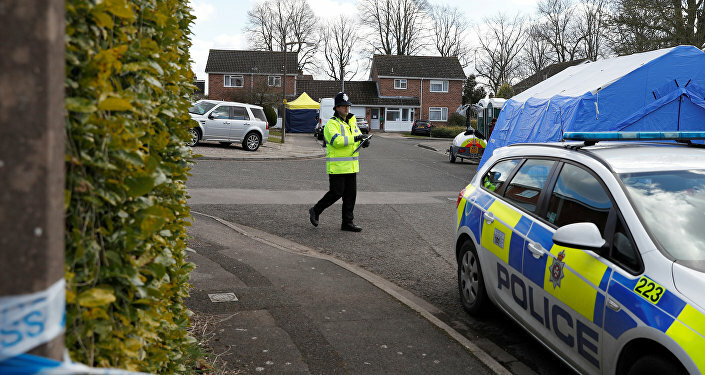 Ex-Russian spy Sergei Skripal, 66, and his daughter Yulia, 33, were found unconscious outside a shopping center in the southern English city of Salisbury on March 4. Police suspect that they were poisoned by a "very rare" nerve agent. The pair are currently hospitalized and in critical condition. The site where they were found has since been visited by 180 military personnel in hazmat suits to remove vehicles and objects from the scene and look for traces of the nerve agent. In 2006, a Russian court convicted Skripal of high treason for collaborating with the UK's MI6 intelligence agency during his service as an officer in Russian military intelligence. The disgraced officer, believed to have blown the cover of some 300 of his fellow agents, was sentenced to 13 years in prison. In 2010, then-President Dmitry Medvedev pardoned Skripal as part of a spy swap program, and the ex-spy moved to the UK, settling in Salisbury in 2011. Tom Tugendhat, foreign affairs select committee chairman in the UK's parliament, said the Skripal incident looked like a case of "state-sponsored attempted murder." Following Skripal's hospitalization last week, British media have accused Moscow of involvement, a claim Russian officials rejected, citing lack of evidence. On Monday, Russian President Vladimir Putin told a BBC journalist that the UK should figure out what happened to Skripal before discussing the issue with Russia.